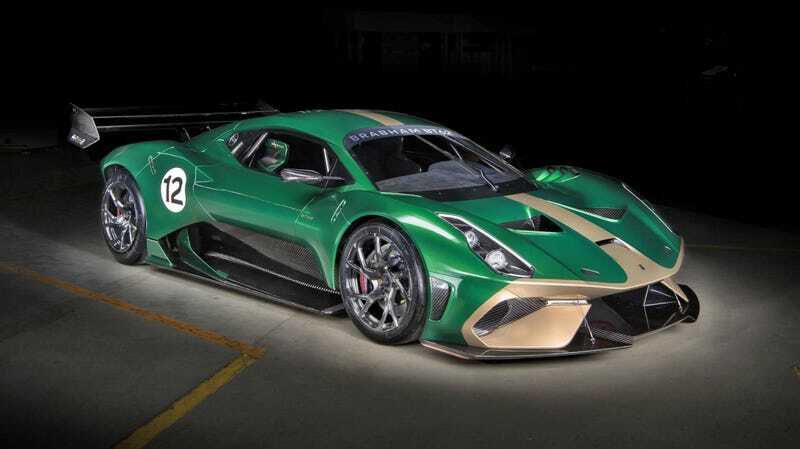 The Brabham BT62 is a $1.3 million 700 horsepower V8-propelled iteration of Le Mans legend David Brabham’s vision of the ultimate track car. Hell, it’s so extreme you have to be taught to drive it properly. Only 70 will be built, making it as rare as it is savage. All of that aside, the question that some have been asking is: Can you make it road legal? Well, after putting the pressure on a Brabham insider, they admitted: Brabham can. And it will if you ask and pay (presumably) a fair wedge. On Sunday at the Goodwood Festival of Speed, the folks at Brabham apparently revealed to clients that there is a way to make its legit race cars road legal and able to jaunt off to the shops for a pint of milk in one of these monster machines should they so choose. Here’s how it’ll go down: tell Brabham you want to daily your race car. After that your shiny BT62 will be put through an IVA (Independent Vehicle Assessment) and be approved to wear a set of UK license plates. Once it’s legal it’ll be shipped back to a place/country/private island of your choosing and you’re free to drop your kid off at preschool in your racing car for a year on your UK plates. Now, just shy of a year after it’s been registered it’ll need to go back to the UK for a service and so on, and the 12-month timer is reset before local laws kick in and you need to get it sorted in… wherever it is you want to keep it. The road conversion back and forth to the UK deal lasts, initially, for two years. If clients wish to keep their plates longer, Brabham will likely be able to sort it for them. What about where you live, specifically, since everyone knows how goofy the laws can be? Brabham will, apparently, have a consultation with clients to see how feasible it’ll be to have your BT62 road legalized for the place of your choosing and how it’ll fit with local regulations. Of course, converting your BT62 for road use will inevitably mean the track-worthiness will take a tiny hit, but who cares when you can take it through a decently wide McDonald’s drive thru? I’ll wager it’ll still be a weapon with plates anyway.